Want to lick your cat? Some of us like to kiss our cats. A few might, jokingly, bite the cat when play-fighting. But, have you ever considered LICKING your cat? Cats love when we scratch and pet them, because it feels like another cat is grooming them, sort of. Your scratches just aren’t scratchy enough. Trying to lick your cat sounds really stupid, especially since your tongue will immediately be filled with cat hair. The solution (??!) to this issue my rest in this new, weird invention: The LICKI Brush. LICKI is a soft silicone brush, designed to feel pleasurable to your cat’s skin. You are supposed to grasp LICKI’s bite portion with your teeth, slowly approach your cat when and, well, lick them. The Kickstarter project has raised over 11,000 USD, with 34 more days to reach the goal of 36,500 Dollars. So, who’s into some LICKING? Going to work and missing your cat? Feel like squishing a bit of a cat paw? This mouse might satisfy your needs. The Pnitty Mouse is toy-like computer mouse shaped like a cat paw, and it has soft, squishy pads underneath. This mouse isn’t available for purchase yet, but it successfully raised money through the crowdfunding site Makuake in order to start marketing. 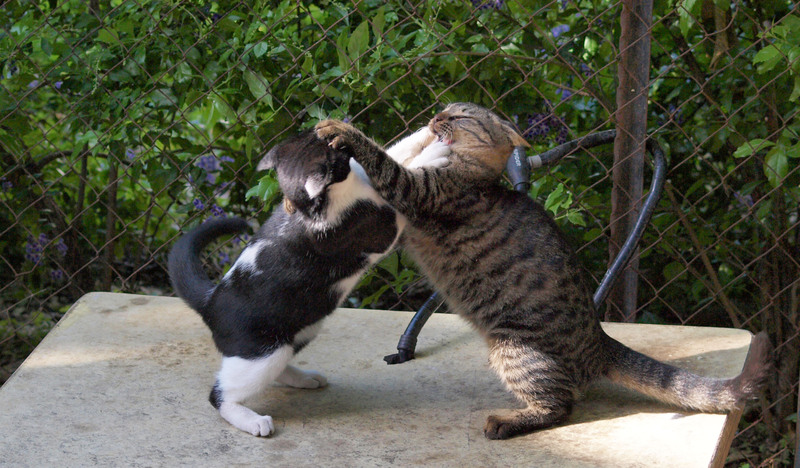 These are Gandalf (on the right) and Bella (on the left), having a go at each other. No kittens were harmed in the process of taking this photo.